Place cards for MILES and MILES and MILES! This particular wedding package was very special to me, as it was for my oldest and dearest friend's wedding. I really wanted everything to be very regal and classy, but to also be as stress-free as possible for the bride and groom. They are both very laid-back on the details and needed some tips to help kickstart their imaginations. We started with the basics...wedding colors. 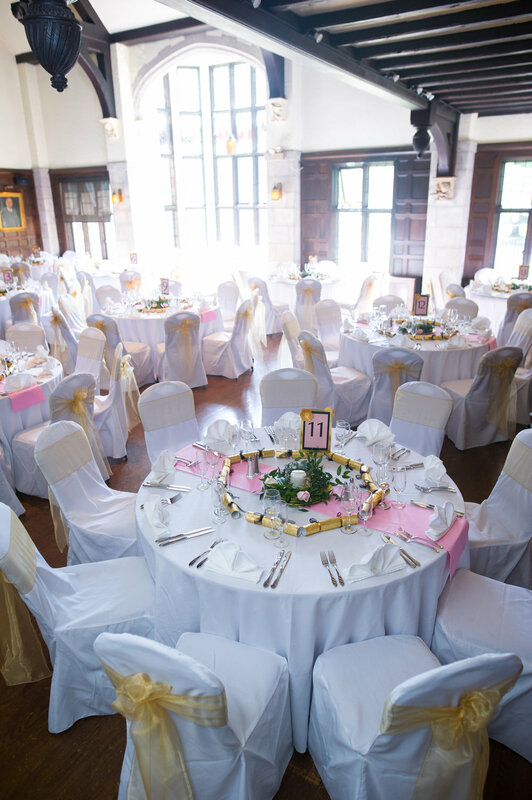 For this wedding it was black and pink with gold and cream accents. From there, I ordered some shimmery black and pink papers, translucent pink vellum as well as the reflective gold cardstock. These would be the base of a lot of the paper goods. We wanted the invitations and guestbook to have a more personal touch, so I embarked on a custom batch of handmade paper. Since papermaking is such a visual and unpredictable art, I made this little video to show you the process of making the paper for the invitations and the guestbook. This was the first batch of paper I made when I got my new papermaking equipment and I was still ironing out some wrinkles. A lot of the fun of papermaking is in the experimentation and you'll see a lot of that here. After the paper was all made and dried, I got to work assembling the invitations. I used a lot of Tombo adhesive and my ATG tape gun. I just loved how everything about this wedding was so sparkly! I wouldn't normally put my logo right on invitations, but my friend wanted everyone to know where she got them, so I obliged her. 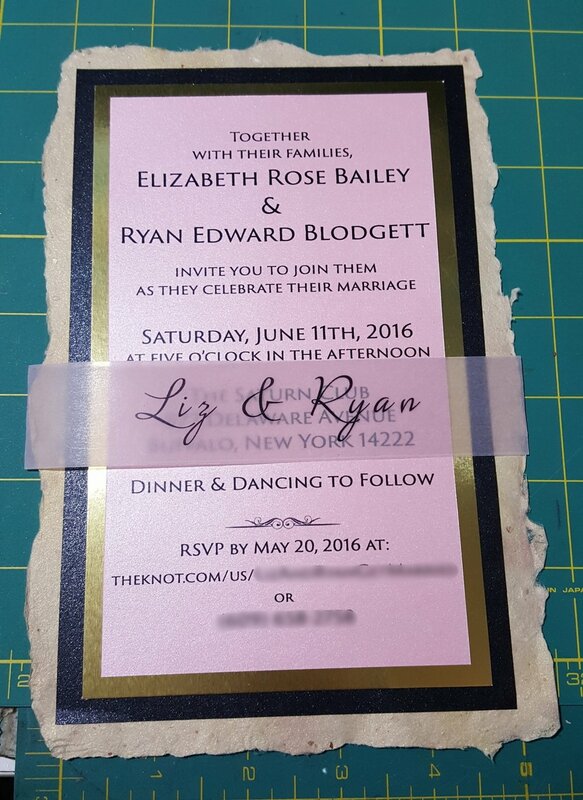 I also printed all the address labels, stuffed the envelopes and got these invites in the mail. As my friend Liz said, "It was a totally stress-free experience." Here are some pics of the assembly process! After the invites went out, I got to work on the place cards, table cards and the guest book! I wanted all the pieces of this wedding to have continuity, but I didn't want the costs to be super high either, so I only used the handmade paper on the invitations and the guestbook cover. I was so busy making all these and the guestbook that I actually forgot to take any photos of the guestbook in progress (doh!) but there were plenty of photos of it at the wedding. The couple had a Polaroid camera and they wanted to do a photo guestbook and have the guests take selfies and then stick them into the book and sign their messages with their photos. I made a 12x12" scrapbook style book with plastic sleeves and I provided enough 12x12" sheets of the shimmery black paper for all the guests to sign. The covers were made with the giant pieces of handmade paper glued over book board and then assembled into a screw-post style book with pink bookcloth hinges. The cover was also decorated with gold and black satin ribbons with champagne colored pearl beading, as well as the couple's names. You can see more in the next section. 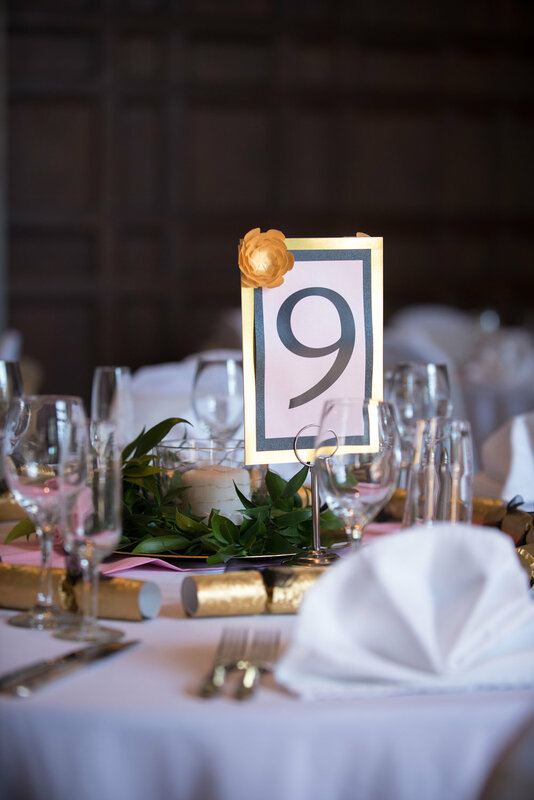 The table and place cards were made of the shimmery black and pink papers with the mirrored gold cardstock in between, all stuck together with ATG double-sided tape. For the place cards, I wanted the mirror gold to catch a lot of light so I only put the tape across the middle of the card so that layer would curl a bit and be extra shiny. I also created little handmade paper flowers for each place card and table card. The photos below are in the middle of the process before the flowers were attached. 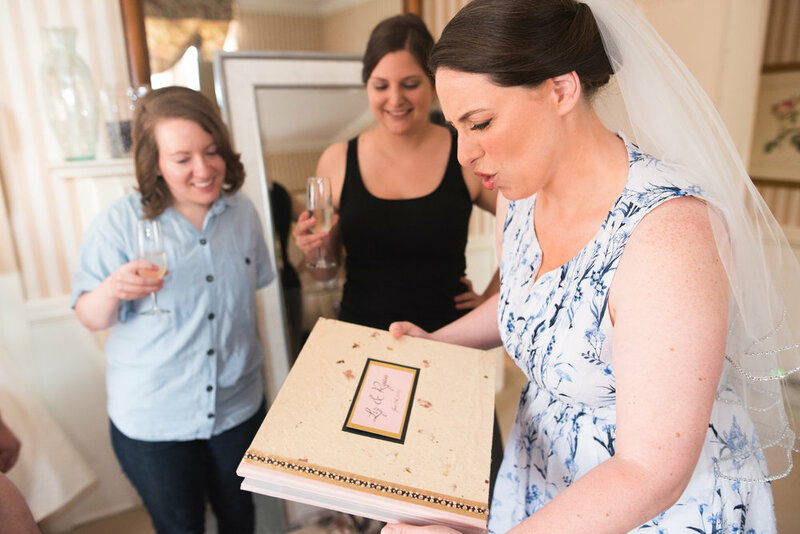 I really wanted the bride to be totally surprised when she saw the guestbook and since I was part of the wedding party, I made sure to get her awesome photographer, Michael Fisher, to capture these amazing pictures of her opening it like a super special present. We've been friends for almost 30 years, so I made sure to put a little funny personal message to the bride and groom in the front of the book and the photographer caught me giggling as she was reading it. Can you tell I get excited about my work? I love love love seeing it in action. Here are some more photos that the wedding photographer, Michael Fisher, took of the paper creations at the wedding reception. Everything about the wedding was absolutely perfect and went off without a hitch. And there was not a dry eye in the house, either from laughing or crying. It was an absolutely fabulous event to witness and I'm so happy I could play a part of making this special day so perfect for everyone involved.